Today I want to write about eggs. That's not some sort of metaphor about the hatching of a new policy, or the neat encapsulating of an idea - I mean those things that come out chickens that are just so yummy. As the person in our house who does the shopping, I think the number of egg options is pretty bewildering. 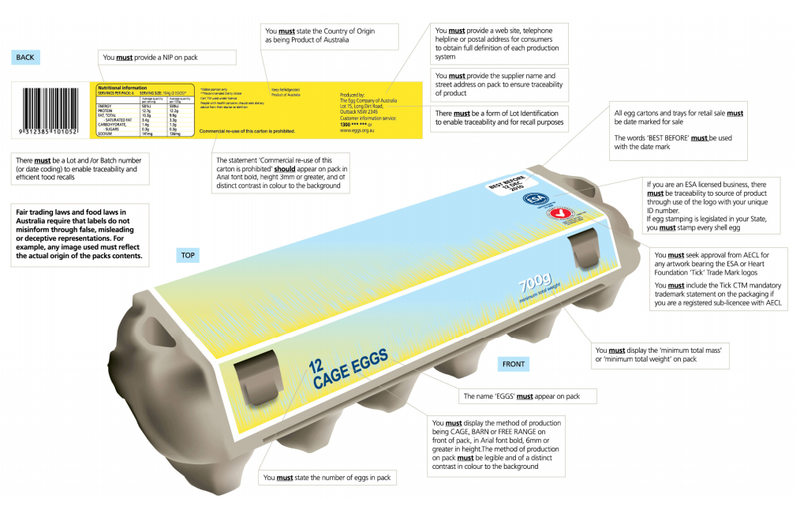 There are cage eggs, free range eggs, barn eggs and then of course there are the eggs with the smiley face stamped on them. I always buy the smiley face ones because the missus likes free range eggs, and because I like to talk to eggs when I crack them and say things like "This oughta wipe the smile off your face!" Getting back on point, there is little understanding amongst the public as to what exactly the different descriptions mean. I don't intend to get stuck into the precise legal framework for this area - there are national standards, state standards, cross-border issues, and heaven knows what else. 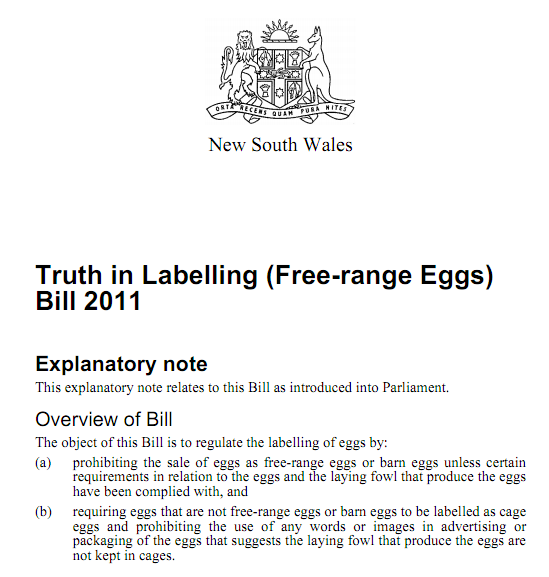 Suffice to say, the Greens introduced a bill to standardise the labelling for Free Range. The full text can be seen here. Have a look at a square metre next chance you get, and imagine 10 chickens per square metre. It's not exactly spacious, but there you go. There was some disagreement as the bill progressed through. 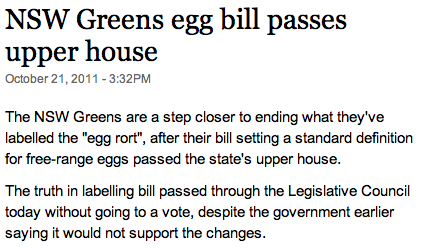 Labor amended the bill and, as I mentioned earlier, the government initially opposed the bill. In those circumstances, the Government would in fact have lost the vote had they maintained their opposition, so it is likely that their vote in support was merely a tactical retreat, or, as I like to call these things, an advance in a different direction. The fact that the Shooters supported the Greens bill is not the only surprising part. A minor party lead the charge on a bill and got it passed, which is no small triumph. Not just any bill as well, but a bill that will no doubt piss off a lot of people. Additionally, there is something to be said for the way this brands the Greens in NSW. Federally, the Greens are perceived (at least in some quarters) as being the party really running the country. Moreover, the Greens campaign for action on Climate Change is probably the only reason that Labor has stuck with the Carbon Tax. At the State level their brand is not as well defined. People seem to know what the Greens stand for generally, but aren't necessarily as clear on what that means in practice. This bill seem to be right in their wheelhouse - it will appear to the younger, environmentally conscious voters and annoy many rural voters who will see it as hurting an already struggling industry. Wins are often hard to come by for a minor party, and no doubt the Greens are feeling pretty good about themselves this weekend.